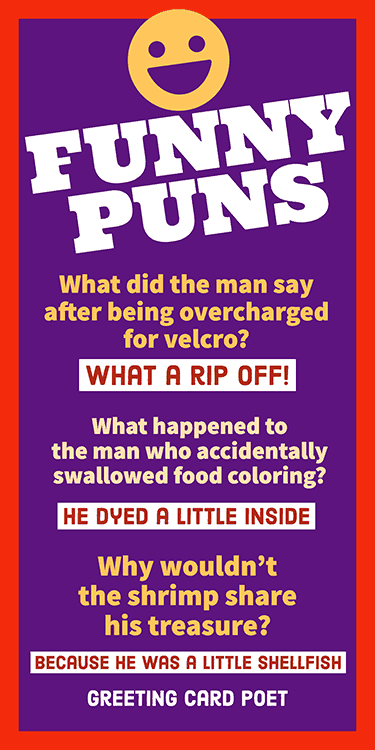 If you love funny puns, then settle in because you’re in the right place. Who doesn’t love a good joke now and then? From clean corny jokes and hilarious one liners, to witty riddles, we’ve got just what you need. 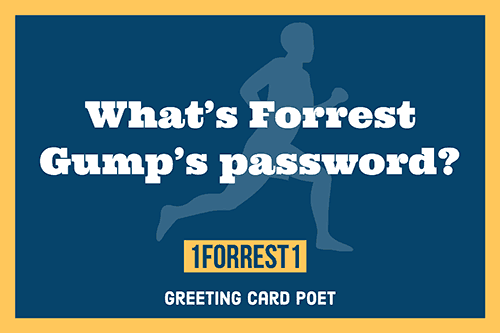 And whether or not you’re a fan of word play, our collection is sure to spark humor, laughter, and enjoyment for anyone. If you need cheering up on a bad day or you just love to laugh, these one liners and questions and answers are guaranteed to bring on a serious case of laughs – seriously just read and see! And, remember, the pun is mightier than the sword. 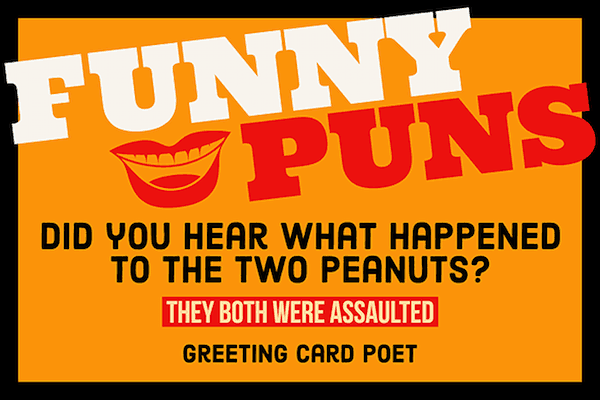 Did you hear what happened to the two peanuts? What’s the best name for iPhone Chargers? Herb gardeners who work extended hours get thyme and a half. Atheism is a non-prophet institution. The waist is a terrible thing to mind (especially if you’re on a diet). Immanuel doesn’t pun, he Kant. Rumack: I am serious … and don’t call me Shirley! We Polked You in ’44, We Shall Pierce You in ‘52. Why should the number 288 never be mentioned in company? Because it is two gross. Check out our funny, hilarious jokes. You’re too young to be smoking. Why are horses better than other animals? Because he’s always playing with Pooh. Why do they put fences around graveyards? What’s a criminal’s favorite drink? 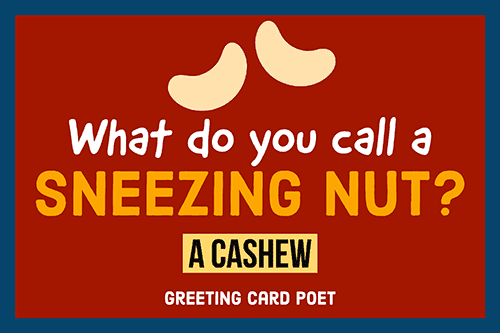 What do you calling a sneezing nut? Because his mom and dad were in a jam. Note: Have any suggestions for our collection? Please let us know via the Contact page. Thanks. Because he took a shortcut. Why didn’t the man get a brain transplant? Because he changed his mind. What did the detective say about the man who got crushed by a pile of books? He only had him shelf to blame. What did the man say after being overcharged for velcro? Why are books about anti-gravity so great? Because they’re impossible to put down. How did the kid learn how to fasten his seatbelt? He doesn’t know, one day it just clicked. Where do baby spoons come from? Why shouldn’t you spell ‘part’ backwards? Because they taste rather funny. What happened to the man who accidentally swallowed food coloring? He dyed a little inside. Why shouldn’t you a chemistry joke? Because know the person you tell it to might get a reaction. What happened to the future, present, and past when they walked into the bar? Why should you never try to eat a clock? Why should you beware of using duct-tape? Because you’ll become too attached to it. What did the woman say after understanding how gems are made. The concept is crystal clear to me. Yes, it is February 14th. Why should you never break up with a goalie? Because he is a keeper. What did one boat say to the other boat? Are you interested in a little row-mance? Why should you not marry a tennis player? Because love means nothing to them. What’s the definition of love? The delusion that one woman is different from another. I don’t know, they just arrrrrr. 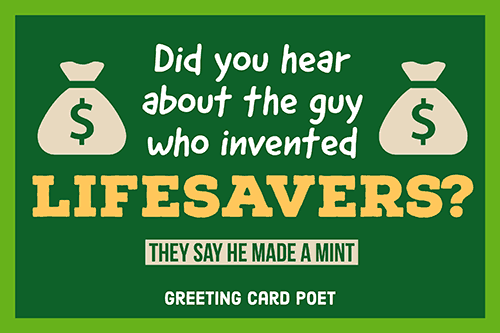 Considered the ultimate form of wordplay by many, puns illustrate the humorous art of jokes. What makes them funny is the combination of the play on words and what your brain actually imagines when you visualize it in reality. The work by bringing words to life by using their many meanings or as well as the way a word sounds in order to create a joke or humorous saying. For example, the word “case,” could mean either a piece of baggage or a instance of a disease. Wordplay humor is subjective, so what may be amusing to one person, may not to another. Regardless, they are still tons of fun and good for the brain! Learn more about the meaning at Merriam-Webster. You’re on our Funny Puns page.